With the 50th anniversary of JFK assassination coming up in a few weeks, all the conspiracy theorists are coming out of the closet to take center stage. And while there are more theories about JFK’s murder than Carter’s Little Liver Pills— even Stephen King weighed in with his 11/22/63— we still don’t have a definitive explanation. I’m not alone in wondering what the real story is. 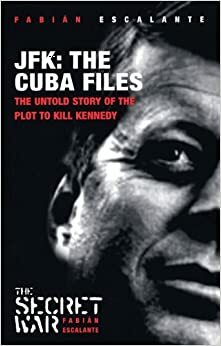 Happily, in my research for HAVANA LOST, my thriller set in Cuba, I came across some interesting books that fed my interest in Cuba and the JFK assassination. One was written by a Cuban; the other by journalists Lamar Waldron and Thom Hartmann. In fact, what I’m about to lay out may sound like a thriller that strains credibility. But stay with me — all of it makes a weird kind of sense when you consider the stakes and the players involved. I realize not everyone will agree, and I’ll get to that—but it’s titillating enough that it’s worth the effort to lay it out. Fidel Castro had nothing to do with plotting or executing the assassination of JKF. The man is not stupid. He didn’t survive 60 years without being shrewd. Attempting to kill Kennedy would have started World War Three, and he knew it. In fact, there’s no evidence he was involved, and plenty of evidence that he wasn’t in this this account written by Cuban historian Fabian Escalante. Admittedly, Escalante has an agenda—he was a high-ranking Cuban Intelligence officer himself, but it’s been pretty well documented by Peter Kornbluh that JFK and Fidel were about to start talks on normalizing relations when he was killed. The assassination brought those talks to a halt. And just recently, a new book by a NY Times investigative reporter says that Castro actually answered questions put to him by the Warren Commission. So if Castro wasn’t involved, who was? 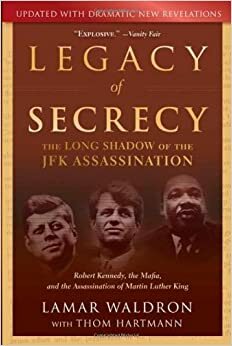 LEGACY OF SECRECY by journalists Lamar Waldron and Thom Hartmann (yes, the same Hartmann who has a progressive radio show) alleges that the killing was a Mafia hit, coordinated by three Mob VIPs. They claim to have taped FBI confessions confirming the principals’ involvement. But why? As many of you already know the Mafia, most notably Meyer Lansky and Santo Trafficante, ran Havana. After Fidel came to power, he shuttered the casinos, and the Mafia were kicked out. They were not happy campers, but Vegas had emerged as an alternative and many put their money there instead. So why would they want to kill the President? Here’s where the story becomes fascinating. You may remember that Bobby Kennedy, as Attorney General, turned on the Mafia and went after them aggressively. He started with Jimmy Hoffa, trying to disrupt his relationship with New Orleans boss Carlos Marcello, head of the oldest—and some say most powerful—Mafia family in the country. Bobby also went after Chicago Boss Sam Giancana who had previously introduced JFK to Judith Exner, an attractive young woman with whom both Giancana and Kennedy had an affair. especially in Illinois. Afterwards, Judith Exner allegedly served as a courier between Giancana and JFK, delivering messages about the CIA and how it was duping JFK in the run-up to the Cuban Missile Crisis. Unfortunately, Bobby destroyed whatever relationship existed when he turned on the Mob. This did not sit well. After the Missile Crisis, according to LEGACY OF SECRECY, Bobby Kennedy secretly planned another coup in Cuba. Only a few people knew about it, including the President, of course, and a few “trusted” CIA officials. Instead of sending a battalion of Cuban exiles to Cuban shores this time as had been the case during the Bay of Pigs, Bobby and Co.enlisted Cuban Army officer, Juan Almeida, one of the top officials in Castro’s regime to engineer the coup. Almeida was supposed to eliminate the Castro brothers (ironic that Fidel and Raoul operated in tandem much like John and Bobby). Almeida would then be installed as the new leader of Cuba, after which he would kick out the Soviets and rekindle a friendship with the US. The coup was planned for December 1, 1963. Ten days after JFK was assassinated. Of course, news of the coup leaked to the Mafia, thanks to people like Bernard Barker—yes, he of the Watergate plumbers fame—who was one of many who floated between the CIA and organized crime and was rumored to be close to Carlos Marcello. The theory is that Marcello, Trafficante, and Johnny Roselli organized JFK’s assassination, mostly to get back at Bobby for going after them. Lee Harvey Oswald was set up to take the fall, and Jack Ruby, who worked for Trafficante, was ordered to kill Oswald so he wouldn’t talk. After Dallas, Bobby Kennedy suspected that the Mafia was behind the hit on his brother. But the Mafia blackmailed Bobby. If he went after them, they would expose the coup attempt, and what would happen to world peace? When the Soviets found out, it could ignite World War Three. At the very least, it would destroy America’s credibility. Bobby was caught between a rock and a hard place, and he remained there until he was gunned down five years later, probably also by the Mob. In fact, there is speculation that the Watergate break in occurred in part to find out what the Democrats knew about the JFK assassination, since Nixon and Richard Helms, who knew everything that went on at the CIA, were close allies. Sounds like a movie script, doesn’t it? The problem is that there are still thousands of documents the CIA has not made public that might support or refute the theory, but they’re not going to be released until 2017. Careful researchers, such as Peter Kornbluh at the National Security Archive, dismiss pretty much everything I’ve said. He claims LEGACY OF SECRECY is not well researched, and there’s really no legitimate evidence that the Mafia did it. He said the CIA might have started a disinformation campaign pointing to the Mob as a way to take the heat off THEM. Which, of course, given their antipathy to Kennedy, as well as their close relationship to Cuban exiles who were sandbagged by JFK during the Bay of Pigs, is a strong possibility. But that’s a totally different post. Indeed, until we know more, a lot of folks are returning to the lone gunman theory. In the meantime, a movie of LEGACY OF SECRECY is underway with Leonardo Di Caprio and Robert De Niro (who plays Marcello). You can bet I’ll be standing in line to see it.